Nagpur: The city’s metro rail project will gather more speed as Nagpur Metro Rail Corporation Limited (NMRCL) awarding the contract to construct 10 railway stations to Infrastructure Leasing and Finance Services (ILFS). The work on the stations will begin within a week, Brijesh Dixit, managing director of NMRCL, said on Wednesday. Of the 10 stations, seven are elevated and three are at ground level. The stations are: Khapri and New Airport (both ground level), Airport, Ujjwal Nagar, Jaiprakash Nagar, Chhatrapati Nagar, Ajni Square, Rahate Colony and Congress Nagar (all elevated). In addition, a temporary station will be constructed between Khapri and New Airport stations, which will be used for the test run. “If need arises we can continue with this station. In any case we are going to use the space in front of this station for parking of private vehicles, buses and autorickshaws,” the MD said. Dixit further said that work on the stations will be done at a fast pace as NMRCL had handed over the designs to the contractor at the time of awarding the tender. “We provided them 181 designs. Usually, final designing is done after the contract is awarded. Another unique feature is that some part of the viaduct will be constructed along with the stations,” he added. 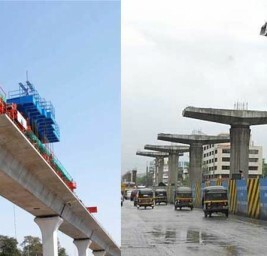 Meanwhile, NMRCL has achieved another milestone by launching its first girder (horizontal portion) between New Airport and Khapri Metro Stations in the viaduct over the proposed Concor siding in Mihan. Over 80 girders of similar spans are ready in the casting yard, which will be launched shortly. “With the progressing launching of remaining girders, track linking work will be started. Eighteen horizontal segments, to be used in the Airport to Sitabuldi stretch, are ready and will be launched from mid-August,” Dixit further said. In another major development, NMRCL has changed the design of Wardha Road flyover for the convenience of motorists. The earlier design was made by National Highway Authority of India (NHAI). Earlier, motorists using the flyover and coming from Manish Nagar side would have to go up to the Airport entrance and take a U-turn for going toward Ajni Square. The new decision will allow motorists to travel in both directions without any detour.